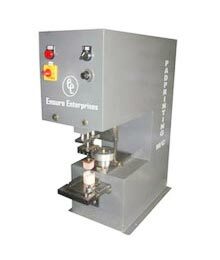 We are an affluent Manufacturer, Exporter and Supplier of Semi Auto Mechanical Pad Printing Machine in Haryana, India. Our Pad Printing Machine is fabricated as per the international quality standards. User friendly, easy operation and robust construction are some of the main features of our Semi Auto Mechanical Pad Printing Machine. The Pad Printing Machine that we offer is highly suitable for printing all kinds of surfaces of different shapes. Our machine can also print electronic parts.